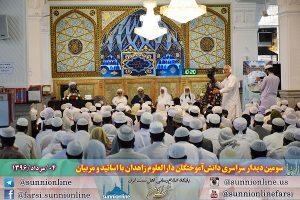 Zahedan – SunniOnline: Hundreds of Darululoom Zahedan’s alumni gathered at this famous Islamic educational center to take part in the 3rd convocation of the graduates on 26-27 July, 2017. The biggest Islamic seminary of the Iranian Sunni community, Darululoom Zahedan, gathered its all alumni of the past 28 years where they met with their teachers and mentors. Most of the alumni belong to the eastern provinces of Iran with a considerable number of graduates from other parts of Iran, Afghanistan and Tajikistan. In the inaugural meeting, Mawlana Abdol-Ghani Badri, a senior teacher of Darululoom Zahedan and secretary of the convocation welcomed the alumni and expressed the aims of gathering the alumni. “The main aim from this meeting is to get the pleasure of the Almighty. The ongoing circumstances of our society and people are not unseen; we want you to remind your duties over the society,” the prominent Tafseer and Hadith teacher pointed. Apart from the speeches and lectures of some senior teachers of Darululoom Zahedan, the alumni could meet their mentors directly and consult them on different issues. The convocation was broadcasted live in internet by the technical team of SunniOnline.us. There were some particular commissions for the collegian alumni, rectors and principals of seminaries, imams of mosques and alumni with free activities. The alumni also took part in friendly meetings with their classmates after the final speech of Shaikh Abdol-Hamid, the principal rector of Darululoom Zahedan. Darululoom Zahedan is the biggest Islamic learning center of the Iranian Sunni community located in the capital of Balochistan, Iran founded in 1974 by late Mawlana Abdol-Aziz. It has more than 3.000 alumni and alumnae. Mr. Osmani, the current minister of the religious affairs in Afghanistan is one of the alumni of Darululoom Zahedan.